Baseball season in Indianapolis is here! For many Indianapolis families, there’s no better way to spend your spring and summer than cheering for the Indianapolis Indians! Our family loves attending Indianapolis Indians baseball games for so many reasons. We appreciate the inexpensive tickets for our family and the awesome promotions that are offered throughout the season. Our kids love the electric buzz of energy and all of the things to do and see. Our absolute favorite ticket option is lawn seating–we love the price, we love the space and we love the flexibility it allows for our kids to enjoy the game while stretching their legs, moving around and just being kids. Other promotions we love for the 2019 season are Dollar Menu Mondays (hot dogs, peanuts, potato chips, Cracker Jack and popcorn are all available for just $1 each), Tuesday Buy One Get One Tickets (with a coupon from any central Indiana McAlister’s Deli location or using an Indians promo code), Thirsty Thursdays ($2 Pepsi fountain drinks, $3 domestic drafts, and $5 premium and craft drafts), Fireworks Fridays and Kids Eat Free Sundays. During every Sunday game, children 14 and under receive a voucher good for a hot dog, bag of chips and bottle of water with the price of admission. Add this to all of the other Kids Eat Free restaurants in Indy, and you’ve got a nice long week of dining out, but with the Kids Eat Free at Sunday baseball games deal, Sunday is the best day of the week! Tickets start at $9 per person for the Indianapolis Indians games. Children age 2 and under are free as lap children. Special deals are available for 2 for 1 Tuesdays. For us, visiting on a Sunday for kids eat free day and sitting in the lawn seats is the most cost effective way to take our family to the game. For even more fun, get your kids a Knot Hole Kids Club membership. It’s such a great value! We’ve always enjoyed taking our babies to the Indians games. We spread out a blanket on the lawn (when it’s not too sunny or hot) and let them stretch out. Babies age 2 and under get free admission, so we can enjoy the game and not have to pay for our baby. Just remember that kids eat free night is only valid for ticketed children. Strollers ARE permitted in the park. There are so many themed nights planned for the 2019 season, my kids are having a difficult time deciding which nights we should go; princess night, superhero night, Star Wars night, Peppa Pig night and more! If you plan on enjoying an adult beverage, please remember to do so safely and make sure you have a designated driver. Visit the Coors Light Designated Driver Booth located behind Section 114 and receive a complimentary soft drink if you are the designated driver for your family. Since we typically sit on the lawn at the baseball game, we bring our own food and drinks along with us. I’ll even pack baseball field favorites that my kids enjoy, like cotton candy, hotdogs, corn dogs and soft drinks. You can only bring outside food or drink into Victory Field if you are sitting in the lawn or have a specific medical need. This is good news for my friends who have children with food allergies or sensitivities. Victory Field offers several concession options that are vegan and/or gluten-free. For parents with special needs kids, it can be difficult to fully enjoy many sporting events. 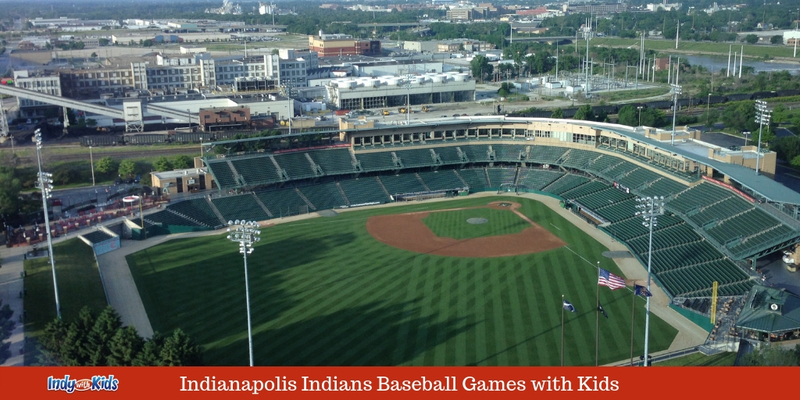 The Indianapolis Indians will do all they can to accommodate your family. Prior to the game, contact Sarah McKinney at 317-269-3542 or Indians@IndyIndians.com for more information or to arrange accommodations. For assistance during games, visit the guest relations desk at the main entrance or ask an usher for help. Not only can you bring your own food when seated on the lawn at Victory Field, you can bring a blanket to sit on. Chairs, umbrellas and tents are not allowed. Our children are very young and so full of energy. Many of my best memories are attending Indians games and letting them toddle around with kids they meet. If it has been wet and rainy the days leading up to the game, consider bringing plastic trash bags or waterproof blankets to put under your picnic blanket. The last four rows of all lower level Box Seat sections are in the shade. The sun sets on the third base side of Victory Field. Home games in Indianapolis run April through August. We hope to see you there!